Did someone say cream cheese and dark chocolate? 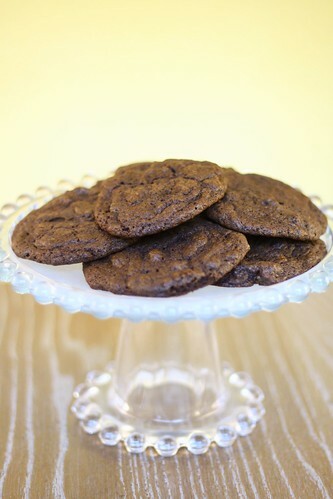 This week's Baked Sunday Mornings recipe features Cream Cheese Chocolate Snacking Cookies from the cookbook, Baked Elements. I had read mixed reviews beforehand so I was skeptical of the results. But I have to say, I was quite pleased with them. These cookies, when made exactly how the recipe directs (chill dough, teaspoon sized drops, turn cookie sheet halfway through baking), turn out a tad crispy on the outside, soft and chewy on the inside...which is exactly the way I like my drop cookies. The dark chocolate and cream cheese add a hint of bitterness, but the chocolate chips offset that - especially when accompanied by a cold glass of milk. I give these cookies two thumbs up! And so did all four of my kids..."This tastes like a brownie," and "it's ok to double-dip in your own glass of milk..." ? Thanks for another great recipe, Baked! Great looking cookies! Love your cake stand! These were great cookies. Chocolate overload without being overly sweet. Perfect! Your cookies look wonderful! Good job! love the "it's ok to double dip in your own milk?" :) your cookies look great!